My partner (Viktor) and I (Tina) live in the country in Adelöv in Sweden with our three Portuguese waterdogs Moa, Bravo and Nessie. Adelöv is located in Småland in the lower part of Sweden. We have had the breed since 2011 and we are totally in love. March 1, 2015, I received my FCI kennel name Agua Fairy's. We are looking forward to all of our plans in the future. We are very active with our dogs and find it fun with courses, competitions, we have gone obedience classes and much more. Right now are we training agility, tracking and we are also going to dogshows. I handle all my dogs by myself. I have studied dogbreeders training by Swedish Kennel Club. The course ended winter 2015. 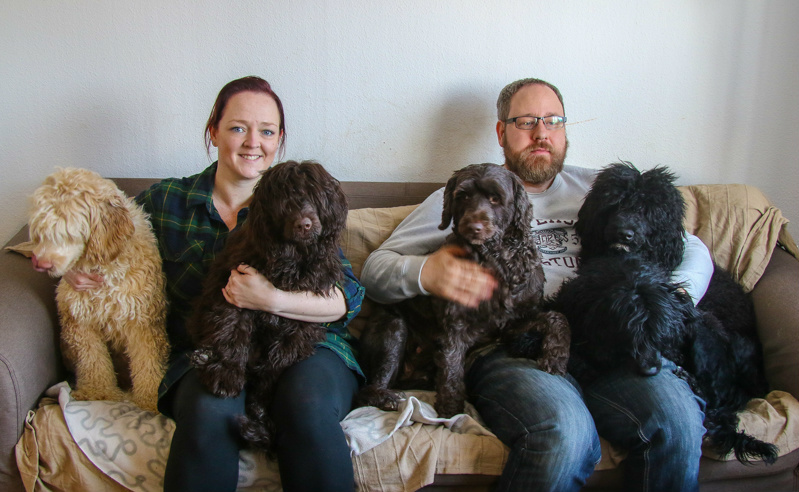 Our goal is mentally and physically healthy and sound Portuguese Waterdogs! We want our Portuguese Waterdogs to look and act like Portuguese Waterdogs should - in other words, as close to breed standard as possible! I am so grateful that I have my mentor Mona Svärd/Kennel Aplicado, by my side to support me and help me with advice and tips.